Hello everyone. Diane covered for me on Monday as my wife was giving birth to our second daughter. My wife came home from the hospital on Sunday night and things were a bit hectic. After some dithering (mostly on my part, I’ve always had trouble settling on names), we named her Elise Rose. She’s a sweetie and very cuddly. 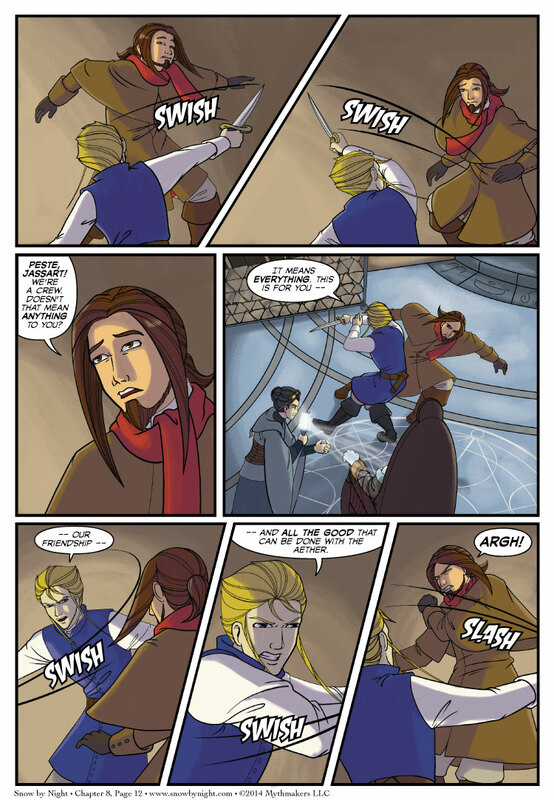 Blaise tries to get past Jassart on Chapter 8, Page 12. Jassart holds him off with some vicious swings while explaining why he is willing to take such drastic methods. Or maybe it’s Jassart writing the narrative that he wants to believe. Either way, to see a preview of the next page, please vote for Snow by Night on Top Web Comics. 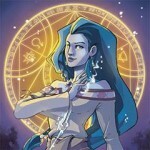 And the webcomic of the week is Evus. It is beautifully drawn. Check it out, when you get a chance. Oh. Oh wow. Congratulations, and hang on for these next wonderful, sleepless months! Older sister is doing well. Nana and Papa came to spend the week. It’s like Disney World came to her! And then it snowed tonight. So there’s a winter wonderland out there today. He also was fine with being a big brother, until month… five or so? Things were good again after a bit until around her second birthday, when she discovered how to push his buttons HARD. So happy for all four of you! Friends don’t draw blades on friends. For as much of a main character as he is, I’d be perfectly okay with Jassart taking a certain dramatic and terminal exit from the comic at the conclusion of this. I guess that’s the end for any chance of reconciliation. That’s a perfectly good coat Jassart just ruined! Blaise needs to punch Jass out, avec vitesse. One moment ago, Blaise tried to break what was holding Snow in place. Now, Blaise is WELL AWARE of Snow’s powers, and the fact that she could easily have harmed, perhaps killed, Bertrande and Jassart. The ‘value’ he put on his link with Jassart seemed to be pretty low then. Now, Jassart is the one who is threatening, and Blaise is pretty much calling him out on the attitude Blaise himself has been showing for a while? Jassart took out a blade… after Blaise made clear his intent to free a creature which probably would take intense retribution upon Jassart. To those who are making Jassart the complete bad guy here, what EXACTLY, would you do at this point in time? Let your supposed friend free something which could easily kill you in revenge? Seriously? I wouldn’t. I’d do my best to stop him from doing just that. Right or wrong, Jassart is at a point that he can’t let Blaise do it EVEN if he DID reconsider. Yeah, Jassert’s certainly in for a pound. Once Blaise showed up this all became almost unavoidable; Blaise’s feelings for Snow committed him to this course when he heard what was happening. The arguments and resulting hypocrisy are really just window dressing. Ah, Jassart…you let slip about the Aether. When you mentioned that, that was the first time you revealed what you REALLY wanted.